This is one of those recipes that’s a true game-changer. And while I will admittedly say I don’t like the term “game-changer” I can’t help but use it here. The truth is, I love beets and I thought I knew everything about how to prepare them. I’ll take ’em raw, roasted, juiced, mashed, steamed, and puréed. However, grilling them is a new (to me) way of preparing this amazing root. Taylor and I have been too hot and tired at the end of the farm day to spend much time in the kitchen. Our outdoor grill is quickly becoming my favorite “non kitchen” tool. There is nothing better than cooking our meals over an open flame while we’re still covered head to toe in dirt. When we share dinner together outside at the end of a long day somehow it always tastes a little better when we’re still in rough form. Our CSA members received beets in their veggie boxes this week (along with many other seasonal gems) and I thought this way of preparing them would be a great way to switch things up. We served our grilled beets alongside lamb burgers (which I’ll post soon because they were so damn good!) and it was the perfect farmers meal. We actually grilled the beet greens as well, but unfortunately I didn’t photograph them because it was an afterthought. However, they were killer and I highly recommend grilling the greens! Just toss them in a little olive oil and place then in a single layer on a hot grill for about 1 minute per side, or until lightly charred. Think crispy kale chips but better!! Anyhow, I hope you all enjoy this simple side dish as much as we do. Fire up the grill, call over the neighbors and dish it up! Prepare the yogurt sauce by combining all the ingredients in a bowl and whisking until smooth. Taste test and adjust seasonings as needed. Preheat an outdoor grill for medium-high heat and oil the grates. Toss the beets with a little olive oil and place cut side down on the grill. Cook, turning every 5 minutes or so, until the beets are tender and lightly charred. About 10-12 minutes total (depending on the size of the beets). Use a fork or knife to check the beets after about 8 minutes to determine how much longer you'll need. 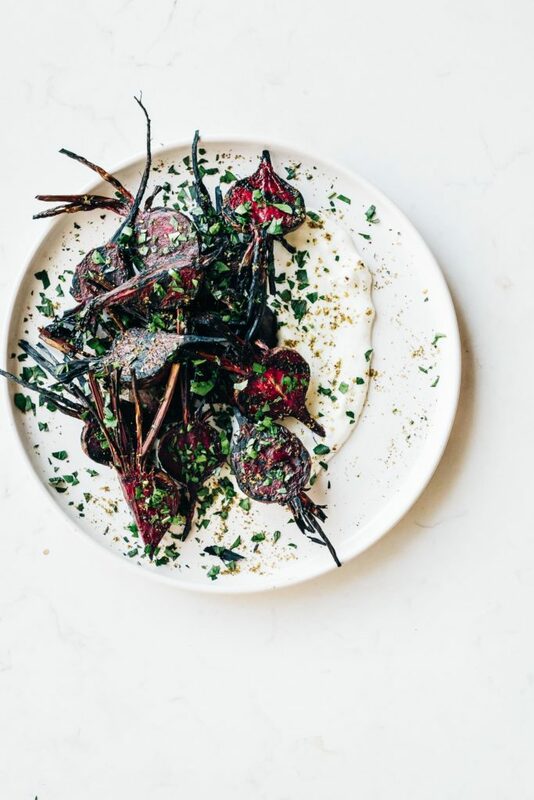 Serve the beets with the yogurt sauce and sprinkle with additional za'atar and parsley. Season to taste with salt and pepper and enjoy. I just had grilled beets yesterday – they were delicious! With lemon yogurt sauce sounds even better! Hi there. I love your stuff! I noticed that selecting “vegan” as a recipe filter still includes dishes with dairy. Just wanted to let you know that vegans typically don’t eat any dairy. Cheers! Thanks for this recipe! I mostly followed the recipe – substituted fresh mint for parsley. Was delicious!